Governor Ron DeSantis today outlined his recommendations for water issues in his environmental budget. Governor DeSantis’ environmental budget recommends more than $625 million for Everglades restoration and protection of our valuable water resources. By investing $625 million each year, more than $2.5 billion will be invested by the end of Governor DeSantis’ first term. This would amount to $1 billion more than was invested to protect our water resources in the previous four years. The budget includes a record $360 million for Everglades restoration projects, a level of funding which will put Florida on track to complete the C-44 Reservoir and stormwater treatment area, the C-43 Reservoir, and 20 additional projects over the next five years. These projects will provide 672,000 acre-feet of storage and remove almost 200,000 pounds of total phosphorus annually, a major source of nutrient pollution. In addition, these projects will significantly reduce discharges from Lake Okeechobee when combined with updates to the Lake Okeechobee Regulation Schedule, as requested by Governor DeSantis in his January 4th letter to the President. The EAA Reservoir project will receive $107 million: $43 million above the annual $64 million to ensure that we are moving forward with the projects needed to move water south. In addition, $40 million through the Department of Transportation’s work program is provided to speed up and complete the final phase to raise the Tamiami Trail, which will restore the flow of more than 900 million gallons per day of water flowing south. The budget also includes $150 million in General Revenue for targeted water quality improvements to achieve significant, meaningful and measurable nutrient reductions in key waterbodies across the State of Florida. This includes $100 million for cost-share grant funds for water quality improvements, including septic conversions and upgrades, other wastewater improvements, and rural and urban stormwater system upgrades. $50 million is included to accelerate projects to meet scientific nutrient reduction goals (called Total Maximum Daily Loads), which may include green infrastructure investments or land conservation to protect our water resources. This funding will support projects identified by DEP, the Blue-Green Algae Task Force and its partners to reduce nutrient pollution and harmful algal blooms in our treasured waterways. The budget includes $50 million to restore Florida’s world-renowned springs. This funding may also be used for land acquisition to protect springsheds and will be crucial to supporting homeowners and local communities as they work with the state to achieve the septic and nutrient reduction requirements of the 2016 Water Bill. The budget supports a more than $25 million investment to improve water quality and combat the effects and impacts of harmful algal blooms, including blue-green algae and red tide. Specifically, $10 million is recommended for innovative technologies and short-term solutions to address the impacts of algae blooms. This includes the continuation of the Department of Environmental Protection’s (DEP) emergency red tide grant program and may also address water quality treatment technologies surrounding Lake Okeechobee. $10.8 million is recommended to increase water quality monitoring, support the Blue-Green Algae Task Force, and to develop a water quality public information portal. This portal will be focused on accountability and transparency, providing monitoring data for all of Florida’s outstanding springs and key waterbodies, as well as allow the public to track the investment in projects and progress in attaining water quality goals. $4.2 million is recommended to establish the Center for Red Tide Research within the Fish and Wildlife Conservation Commission (FWC), and to support the Harmful Algal Bloom Task Force and partnerships for mitigation and technology development with a renewed focus on red tide. An additional $1 million is recommended for the Department of Health to conduct a study on long-term health impacts of red tide and blue-green algae. 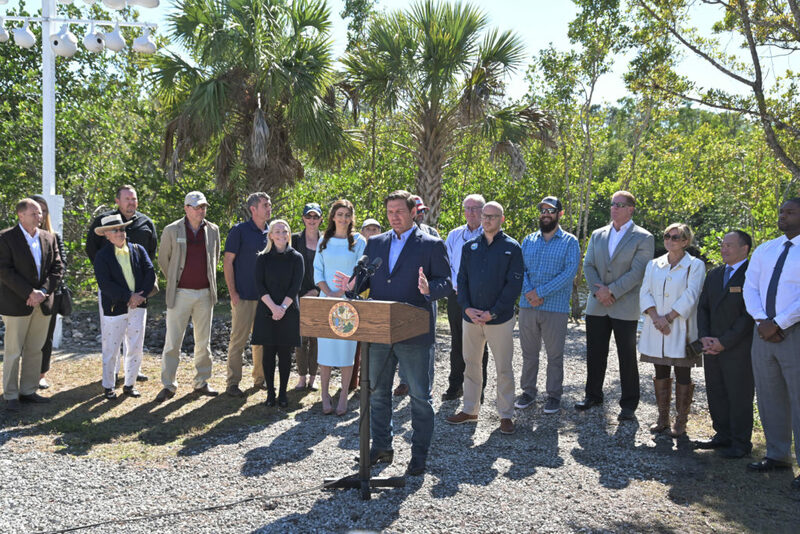 Governor DeSantis recommends $40 million in General Revenue for an alternative water supply grant program to help communities plan for and implement vital conservation, reuse and other alternative water supply projects. DEP will engage local governments, industry, universities and water management districts to identify and research all viable alternative water supply sources and is working to provide an assessment of funding needs critical to supporting Florida’s growing economy. Governor DeSantis also recommends a transfer of 19 positions, composing the Environmental Crimes Enforcement Unit, from FWC to DEP. This will move the investigations and criminal enforcement back to DEP to align resources focused on environmental protection, allowing DEP to address both civil and criminal investigations for the environmental laws that fall under their purview. This will allow DEP to comprehensively protect the environment from criminal environmental actions, while maintaining record compliance and its investment in public education. Details of the remainder of Governor DeSantis’ Environmental Budget will be released later this week, which will include investments in Florida Forever and Coastal Protection.